Should I Wear Cycling Shoes for Adventure Racing? Cycling is growing in popularity all the time and with this many enthusiasts are upping their game and gear. A lot of experienced cyclists will opt of Clipless Pedals and cleats every time. We have covered trail runners in the past so now we want to give you the pros and cons of Clipless pedals and cleats. With cleats, you feel more connected with the bike. Everything is more secure. Your foot is always in the right place and in bad weather your foot will not slip. When peddling on flat peddles, the only time you can move the peddles is in a downward motion as with cleats you get to pull the peddle back up, thus increasing the power in each rotation - motion mechanics for all you engineers out there! When you are clipped in the peddle, you have direct connection to the bike. This means that you are transferring all your energy into peddling. You are tied to the bike. No other way to describe it. 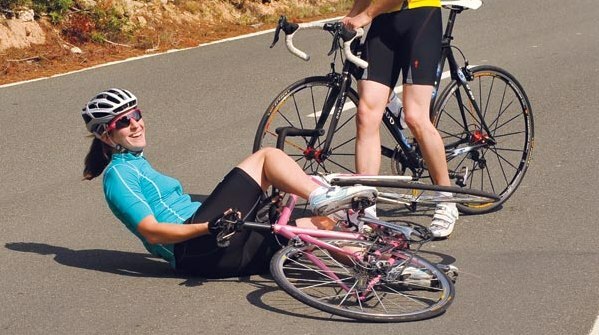 If you do not unclip when stopping you are going to roll over in a very comical fashion. This can hurt!! This ties into the point above but I feel it different enough to have its own point. Say a car pull out in front of you. You are being strapped into the bike, can’t stop by using your feet. This is more down to actual racing, especially triathlons or adventure races. At a bike transition spot, you unclip your feet. rack your bike. Take off your cleats. Put your runner’s on and go. If you are on flat peddles, then you just hope off the bike, rack it and go! Simple. Can be more relevant on events where there are more than 1 transition. "I would think it is worth wearing trail running shoes on the mountain sections and clip in SPD shoes on the bike sections so change them at the transitions"
So there you have it....even we can't all agree!